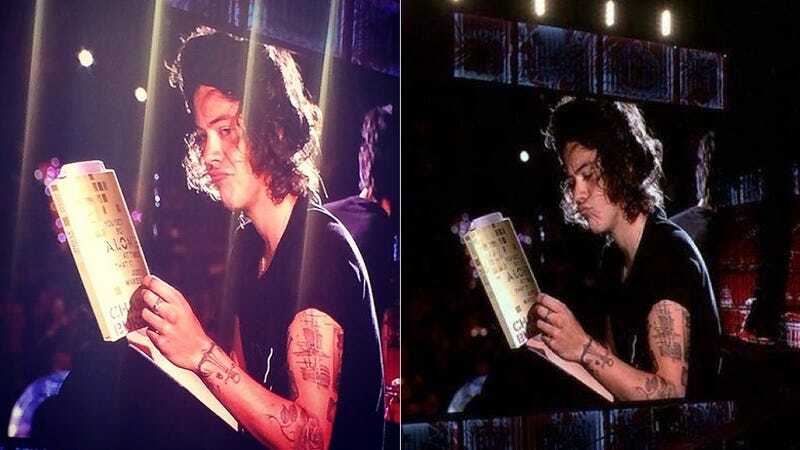 During a recent One Direction concert in Boston, Harry Styles clasped a copy of Charles Bukowski's You Get So Alone at Times That it Just Makes Sense in his tattooed fingers and pursed his lips contemplatively. "Ah," thought Harry Styles, reaching unprecedented heights of Hot Brooding Teen in that singular incandescent moment. "Real loneliness is not necessarily limited to when you are alone. But of course." Beside him, his hapless bandmates continued rhythmically flapping their arms. Somewhere in the world, a solitary man poured himself a drink and muttered a curse word. The mood on stage seems to be very good-natured, and judging the videos unveiled since the start of their American tour, the stars look like much fun. However, is it the same for Harry Styles? Yesterday, the young man was seen on stage with a book in hand. During a concert, the singer was flipping the work of Charles Bukowski entitled Alone, which certainly surprised Directioners present that night. The young man would it be bored during the show, or that he was just part of a scene? Of course, Directioners have probably quickly realized that the singer was simply humor. Anyway, fans will surely be delighted to see their idol takes time to grow, even on stage. Could it be to impress the eldest daughter of Bruce Jenner? According to another site, Niall was giving a speech while Harry read the poems. Liam sang a bit of "Loyal" by Chris Brown. "Having nothing to struggle/against/they have nothing to struggle/for," thought Harry, probably. Harry looked out at the crowd. "The courage it took to get out of bed each/morning/to face the same things/over and over/was/enormous," intoned the writhing masses, as if in a fever dream, gnashing their teeth with longing.